Mouse anti-bat mAb | Health Research, Inc.
One of the problems with studying bat immunology is that no serologic assay exists to probe bat responses to various pathogens such as rabies, severe acute respiratory syndrome (SARS) and Geomyces destructans, the etiologic agent of white nose syndrome, a condition associated with an unprecedented bat mortality event in the United States. Filling that gap was ideal for our organization since our rabies lab receives bats for testing throughout the year. So far, experimentation with our unique mAb (BT1-4F10) showed that it could distinguish between rabies infected versus non-infected bats in an assay commonly used to detect rabies but never before in bats. 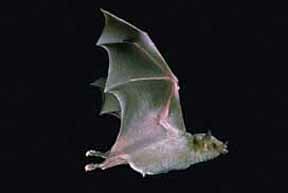 Emerging pathogens, many of them viruses, continue to surprise us by an underappreciated source, bats. Although bats are among the most abundant, diverse and geographically dispersed orders of terrestrial mammals, typically little has been studied about the bat as a host carrying microorganisms and transmitting pathogens to other species. In fact, bats are increasingly proving to be rich reservoirs of emerging viruses and re-emerging viruses as we disrupt by encroaching natural areas exposing not only ourselves, but our domesticated animals to viruses that earlier lacked opportunities to jump species. Figure 1. is an SDS-PAGE gel immunoprecipitated bat serum using mAb BT1-4F10. The left side (NR) is non-reduced, showing the whole protein. The right side (R), is the reduced lane which shows the different chains of precipitated proteins. This is a Coomassie stain (identifies all proteins), therefore, it shows that mAb BT1-4F10 binds to a part of proteins of the molecular weight of IgG and additional Igs. The IgG and L chain are identified by their molecular weight; however, the identities of the mu and gamma chains were confirmed by mass spectrometry. 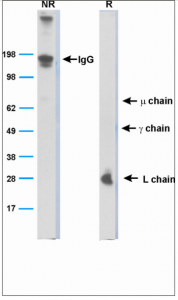 Figure 2. is a Western blot analysis of whole serum as detected by mAb BT1-4F10. 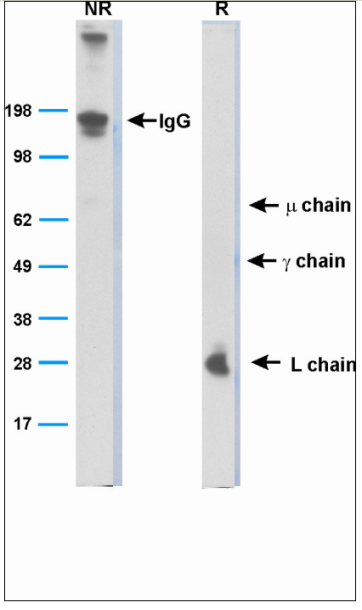 Again, the left side shows the non-reduced proteins, mainly IgG protein because all of the chains are attached to each other. The right side is the reduced lane, where the different chains are separated and the one directly bound by the mAb (Light chain) is visualized. 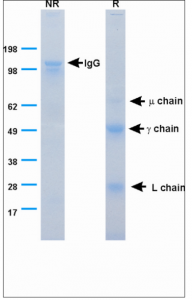 This shows that mAb BT1-4F10 recognized bat L chain and because L chain is part of the entire Ig molecule. The monoclonal antibody identifies all immunoglobulin classes, IgG, IgD, IgE, IgA and IgM. We have about 75 different mAbs that react with different bat cells, blood products and different types of bat immune cells yet to be characterized.